Those individuals responsible for the management and oversight of an employer-sponsored plan have personal liability according to the Employee Retirement Income Securities Act of 1974 (ERISA), because they make decisions on behalf of plan participants and their beneficiaries. 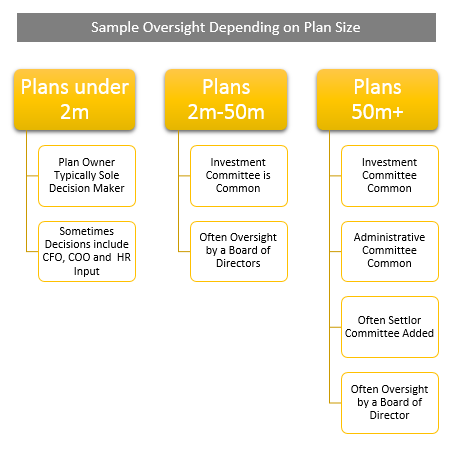 Helping your clients set up a committee to clearly define and document a process of plan oversight is an effective way to help them limit the liability associated with managing a 401(k) plan, and provide tremendous value. Many companies and benefit plans are small enough that creating a formal committee for plan oversight is not a viable option. As companies grow and plan assets increase, formalizing the committee structure makes more sense. Depending on plan size, you might even consider helping your clients form one committee to oversee the administration of the plan, and another to oversee the investment responsibilities required. Some companies will often form a third committee for decisions that are considered “settlor functions” (company and/or business related decisions which are not subject to a fiduciary standard of care). In the image above, you’ll see that for plans under $2 million in assets, there is rarely an investment committee. In fact, the Owner is typically the sole decision maker. Although sometimes, they get input from the CFO, COO and/or HR (as those roles are added to the company). For plans $2 million to $50 million, an investment committee is common and often the committee members are appointed by, and report to, a board of directors. And for plans over $50 million, this is where it’s not uncommon to see an investment committee and an administrative committee, and as the plan grows, a separate committee for settlor functions (and all typically have oversight from a board of directors). Forming an investment committee is optional and each committee set-up should be structured around the company’s capabilities and needs. That being said, here are some basic suggestions for setting up and running an effective committee. Committee Demographics: When setting up an investment committee, members are most often senior management personnel from the areas of human resources, finance, and operations. Committee Requirements: There is no specific job title or experience requirement for an effective committee member. However, it is essential that members are willing to fully understand the roles and responsibilities of the position, and commit to working together in the best interest of the plan participants and their beneficiaries. Committee Understanding: Each member should be educated on the basics of ERISA including fiduciary duties, plan procedures, investment review guidelines, and plan documents. Size of Committee: Five to seven members are optimal. It becomes difficult to get anything accomplished with too many members and with too few, there is not enough perspective. Having an odd number helps prevent voting ties. Frequency of Meetings: Committees generally meet quarterly, unless the situation warrants more frequent or less frequent meetings. Committee Structure: It’s a best practice to appoint a Chairman to run the meeting and a Secretary responsible for keeping minutes and serving as the official custodian of the plan documents and committee records. Formalization: Formalizing the committee is important to outline the responsibilities of all members and investment fiduciaries and is typically done through the use of a document such as a committee charter or committee by-laws. Fiduciary Acknowledgement: All committee members should acknowledge their appointment to the committee and fiduciary status in writing, if they have voting rights on the committee. Documentation Practices: Meeting minutes should be documented including any decisions voted on and documentation should include what items were evaluated and reviewed when making decisions. Consistency: An agenda should be followed for each meeting to provide a consistent process for reviewing key items. Regardless of whether a company sets up a formal committee or not, a basic set of guidelines can help plan fiduciaries understand their roles and help ensure participants’ interests are put first in all plan decisions. 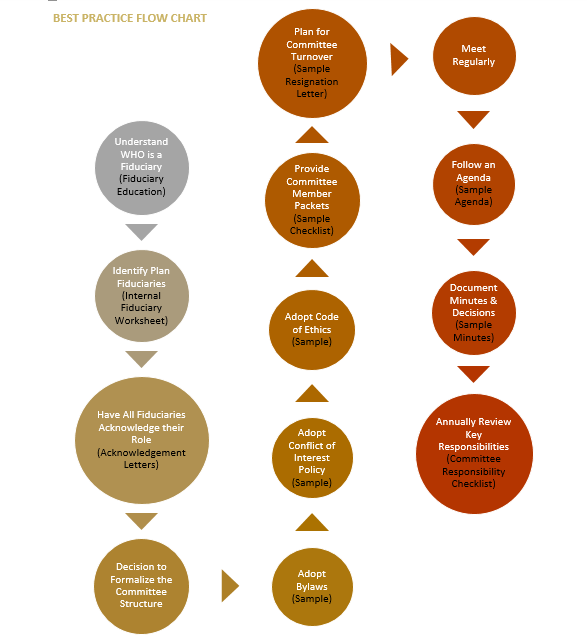 The following flow chart follows a process that can help plan fiduciaries understand, formalize, and manage their responsibilities with documentation that demonstrates the decision-making process. Identify all fiduciaries and have them acknowledge this position in writing. Create a formal process for helping fiduciaries understand and document their responsibilities. Ensure committee members engage in a proactive, organized process that is documented. 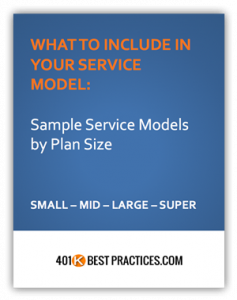 If you can help your 401k clients with the steps outlined below, they’ll be better prepared to demonstrate the prudent management and oversight of their plan. 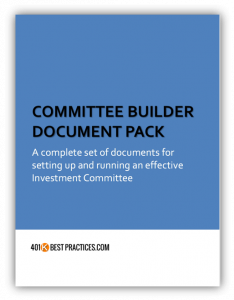 Sample documents of all of the steps listed above can be found in the Committee Builder Toolkit. Looking for a solution to help plan sponsors set up and run an effective Committee?